Whether you need doors for an entire house or one special entry unit, we strive to bring your vision to life by offering you doors in any wood available, and any design possible. 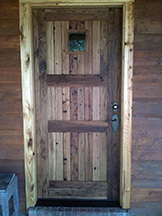 We build custom doors that are exactly that... custom to your desire and need. Constructed of solid wood with the time honored and tested method of mortise and tenon joinery, we believe your doors should be beautiful today... and for generations to come. 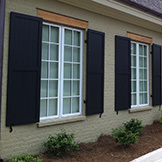 We are proud to be distributors of Permex Custom Exterior Shutters because of the value they provide to our customers. These high quality shutters are constructed of PVC reinforced with steel rods and have the exact look and feel of painted wood shutters—without the hassles. They come painted with the color of your choice and a ten year paint warranty backed by Sherwin Williams. Custom sizes, built to order, same design options as a wood shutter—louvered, raised panel, flat panel, bead-board, board & batten —, and a lifetime warranty on the shutter... we believe these facts make these paint grade shutters a better investment for you than wood. We can run custom siding to match your original in large or small quantities. All we need is a sample piece to duplicate and we’ll match your siding exactly—or tell you if we can’t. 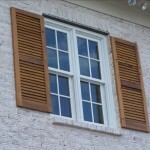 We also build custom stain or paint grade wood shutters in your choice of wood and style, and cut corbels out of your choice of wood, your choice of design—small or large quantities. While we do not keep an inventory of wood on hand, we can order, and have within a few days, numerous species of kiln dried lumber, both domestic and imported—including many exotic woods. We can typically get rough lumber in 8/4, 6/4, 5/4, and 4/4 thicknesses. Surfacing from one to all four sides is also available on most species for a small up-charge. A few of the species available include:	Spanish Cedar, Cypress, Poplar, African Mahogany, Genuine Mahogany, Sapele, Red Oak, White Oak, Southern and Appalachian Cherry, Walnut, Teak, Hard and Soft Maple, Ash, Pecan/Hickory, and Long-leaf Pine. 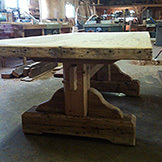 We build custom wood furniture to your design, whether an idea or a picture, in your choice of available woods. In addition to the wood species listed above, reclaimed lumber—heart pine, cypress, and red oak — is also often available locally. If you’d like a piece, or a house-full, of solid wood, handcrafted, one of a kind furniture, we’d be glad to turn your idea into a reality.